JTicketing Events Manager App v3.3.5 is here! 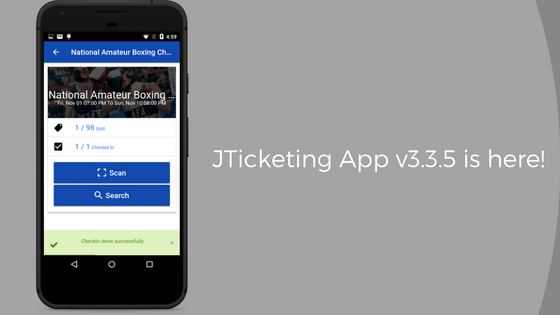 We are happy to bring to you the new version of JTicketing Events Manager app, version 3.3.5. Besides support for the changes with respect to check in for the latest version of JTicketing v2.1, we have made UI improvements for toast messages. From v3.3.5 onwards, JTicketing App will use different sounds for failure and success after check-in happens in the app. You can download the Pro versions of the app for iOS and Android from the app store and play store respectively. You can download the Free versions of the app for iOS and Android from the app store and play store respectively. Read on for the detailed changelog and screenshots.